Class I therapeutic antibodies achieve their clinical efficacy not only by binding to their target antigen but also through Fc domain-mediated recruitment of immune cell effectors to attack and kill the target cell. Therefore, developers of therapeutic antibodies must assess all possible mechanisms of action (MOA) of their molecules, including Antibody-Dependent Cell-Mediated Cytotoxicity (ADCC). 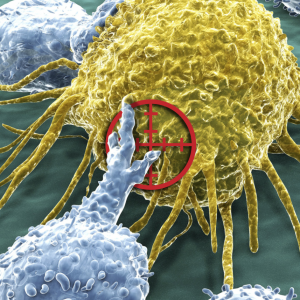 The success of ADCC assays is highly dependent on the quality of immune effector cells used. However, primary human cells (such as isolated PBMCs or NK cells) suffer from inter-individual variability, whereas NK cell lines often show high background lysis in susceptible cell models and functional variability under different culture conditions. Also, ADCC assays that measure cell death often have low signal to background ratios and suffer from this donor variability of the PBMCs. DiscoverX has introduced immune effector cells, the KILR CD16 Effector Cells, that can be used to measure target cell death in ADCC and Bi-Specific Antibody-Mediated T Cell Redirection (TCR) assays for screening, characterization, and QC lot release of antibody drugs. 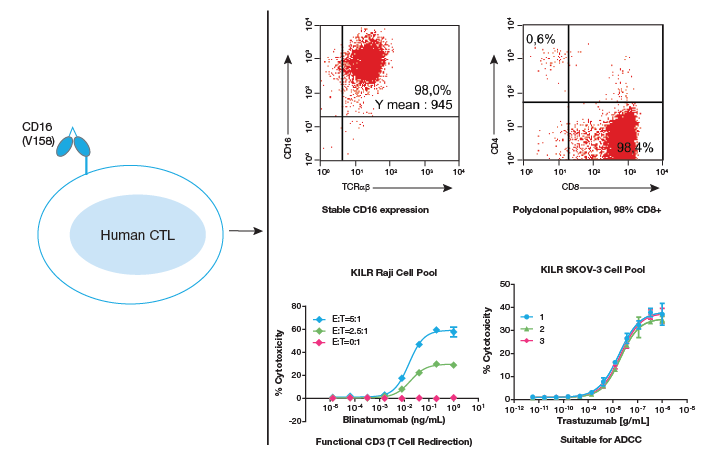 The KILR CD16 Effector Cells are single donor-derived human Cytotoxic T-lymphocytes that have been stably transfected with human CD16 (V158) that maintain their T cell phenotype (TCR α/β+, and functional CD3), and are predominantly CD8+ cells. Importantly, CD16 expression and killing capacity are consistent across multiple batches of manufactured cells that deliver significantly larger assay window than PBMCs, allowing better antibody activity analyses. When used in ADCC assays, these effector cells have very low background, resulting in robust assay windows with excellent repeatability and precision, making these cells well-suited for characterization and lot release assays, without worrying about donor variability. These effector cells are also compatible with T cell redirection applications as demonstrated by using the clinical molecule blinatumomab (Blincyto®), to effectively engage and activate the CD16 effector cells to lyse the target cells. These cells provide faster killing kinetics compared to the Pan-T cells used in TCR applications, without worrying about donor variability. ADCC and redirected T cell mediated cytotoxicity data using these new KILR CD16 Effector Cells was presented at PEGS 2017, held from May 1-5 in Boston and CASSS Bioassays, held from May 8-9 in Silver Springs. You can view and download this poster from the link below. Dr. Jane Lamerdin, Director of R&D at DiscoverX, will be presenting further details and data on the new immune effector cells. This webinar is scheduled for June 27, 2017, at 8:00 AM (PST) and will cover how the KILR CD16 Effector Cells ensure assay reproducibility with higher signal to background ratios, without worrying about donor variability. You can register for this webinar using the link below.